A few short weeks after they pulled Billy Wilder's Fedora off of the home video MIA list, Olive Films has resurrected another long-out-of-print title from another master filmmaker, 1982's Come Back to the 5 & Dime, Jimmy Dean, Jimmy Dean. This flick marked Robert Altman's retreat from Hollywood after the commercial debacle of 1980's Popeye. It also marked the beginning of Altman's decade-long interest in low-budget projects that are essentially filmed plays (Secret Honor and Streamers are two other noteworthy titles from this era). Like many of Altman's play adaptations, Jimmy Dean, Jimmy Dean avoids the temptation to "open up" the story and hide its theatrical origins. The action is confined to one location -- a past-its-prime Texas variety store and lunch counter -- which is clearly just a set with a painted backdrop for the outside. 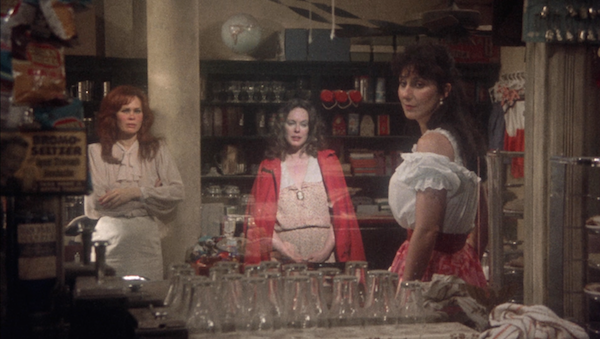 Altman treats the mirror in the store like a theatrical scrim and stages the story's many flashbacks "in the mirror." Besides the design, the script has a distinctly theatrical style too. The main cast are introduced to us in drips and drabs in the talky but cryptic opening section, where an old James Dean fan club reunites in their old hometown on the twentieth anniversary of the star's death. This is followed by a more dramatically engaging midsection, in which a mystery woman arrives to put a damper on the nostalgia trip and only gradually reveals her connection to the attendees. This all inevitably climaxes in a series of emotionally revelatory monologues for the show's three leading ladies. Despite this formulaic structure and stubbornly stagebound aesthetic, Jimmy Dean, Jimmy Dean is generally more dramatically satisfying than it is frustrating. The cast, for one thing, is remarkable. Sandy Dennis is neurotically squirmy as Mona, a woman obsessed with James Dean, who claims the actor fathered her son back when she appeared as an extra in Giant. Cher is effervescent as Sissy, the sexpot waitress at the five and dime, who is always teasing her defiantly Christian boss Juanita (Flo's Sudie Bond). The most intriguing and nuanced performance probably belongs to Karen Black as Joanne, the mystery woman. Meanwhile, Kathy Bates and A Perfect Couple's Marta Heflin also appear, as brash wiseass Stella Mae and meek expectant mother Edna Louise respectively, but their characters spend far too little time onscreen. The specter of Tennessee Williams hovers over much of the film. The setting recalls the dry goods store at the center of The Fugitive Kind, while Mona suffers the same kind of delusions-verging-on-madness that afflict so many of Williams's heroines. There's even a Williams-y subplot involving repressed homosexuality, in which Mona flashes back to her friendship with a queer (maybe bi-curious?) boy named Joe (A Nightmare on Elm Street Part 2's Mark Patton) who ended up severely beaten in front of half the town. Most of the reviews for Jimmy Dean, Jimmy Dean over the years characterize it as a film that succeeds on the basis of Altman's ingenuity as a director overcoming a creaky piece of material. That's not completely off base, although some of the oddest elements of the film are clearly Altman's invention. The choice to have the nearly middle-aged cast members play their teenaged selves in the behind-the-mirror flashbacks, often while wearing their "present day" costumes, is unnecessarily showy and confusing a lot of the time. That said, Altman largely delivers. He sets a tone that allows all of the performances to be natural, assured, and affecting. His camera is as restless and energetic as ever, without being too self-conscious or stagy. Unlike many filmed plays, this doesn't look like television masquerading as cinema. In the realm of forgotten Robert Altman movies, Come Back to the 5 & Dime, Jimmy Dean, Jimmy Dean is not a masterpiece like California Split, and, in the realm of good forgotten Robert Altman films, it isn't merely an interesting footnote like The Gingerbread Man either. Hopefully the film's re-emergence on home video will give movie buffs a chance to better appreciate the still-rewarding vitality of this transitional period in Altman's filmmaking. This film was originally shot on Super 16mm film, and this AVC-encoded 1080p 1.78:1 transfer maintains the gritty, grainy nature of the original shoot. Detail can get fairly soft, but that seems to be an issue present in the source image. The film has an intentionally sun-dried atmosphere, so the colors are not particularly vibrant, but again that seems to be the way the film has always looked. There are no real issues with compression artifacts or any other typical digital problems. The print is mostly free from dirt and debris. It's a solid presentation. Altman is famous for his cluttered soundtracks, and the DTS-HD MA mono audio does a surprisingly strong job handling the jumble of voices, music, and occasional sound effects (distant thunder and the like) without turning into an undefined porridge or an overmodulated mess. I particularly liked this mix, even without stereo or surround effects. No subtitles. Interview with playwright Ed Graczyk (HD, 20:16) - A somewhat contentious interview, in which Graczyk talks about the play's long and arduous journey from its 1976 debut in Columbus, Ohio, to its Broadway run in 1980. He seems to disagree with a lot of Altman's choices in the Broadway version, and he does not have much to say about the film version (apart from considering it a slight improvement) because he was shut out of the production process. 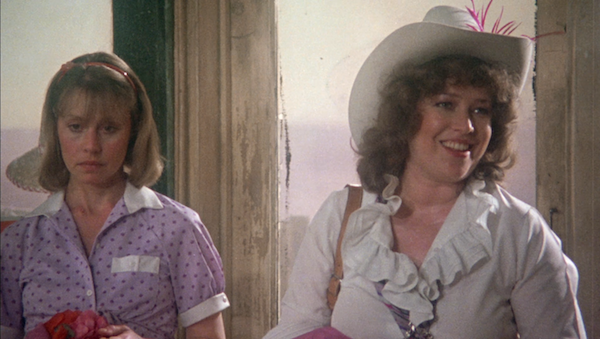 Come Back to the 5 & Dime, Jimmy Dean, Jimmy Dean is elevated by its strong, memorable performances and Robert Altman's inimitable visual panache. Recommended.